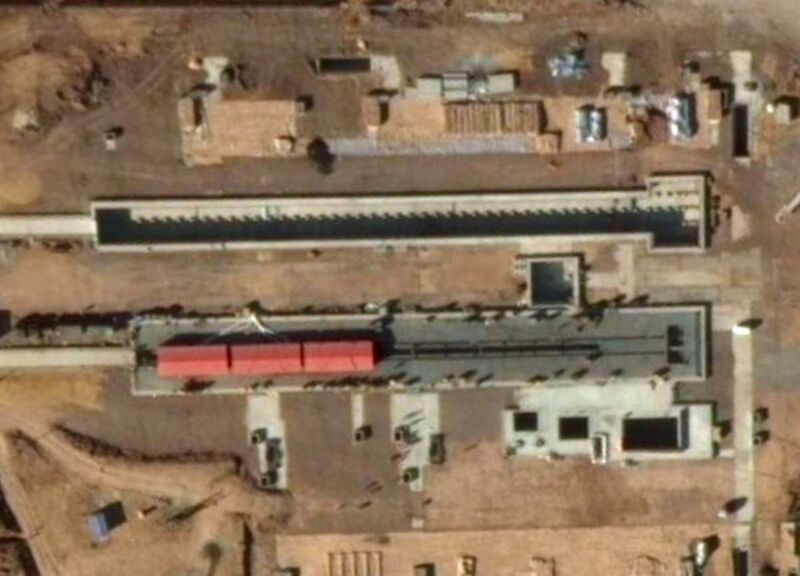 China’s first domestically built carrier, “Type 001A”, is making brisk progress in its Dalian drydock. 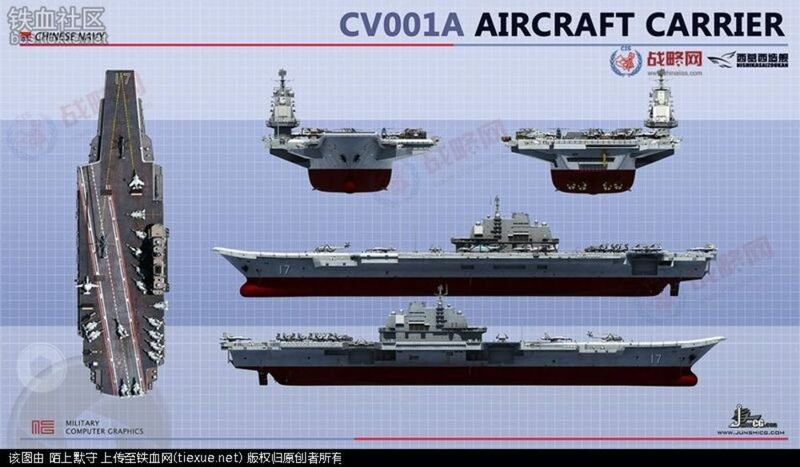 Tracing its design to the Soviet Admiral Kuznetsov class of aircraft carriers, the Type 001A will displace around 60,000-70,000 tons, is powered by steam turbines, and will carry between 30 and 40 helicopters and J-15 fighter jets. Type 001A first began construction in late 2014, and is expected to be launched in 2017, with commissioning in 2019-2020 timeframe. 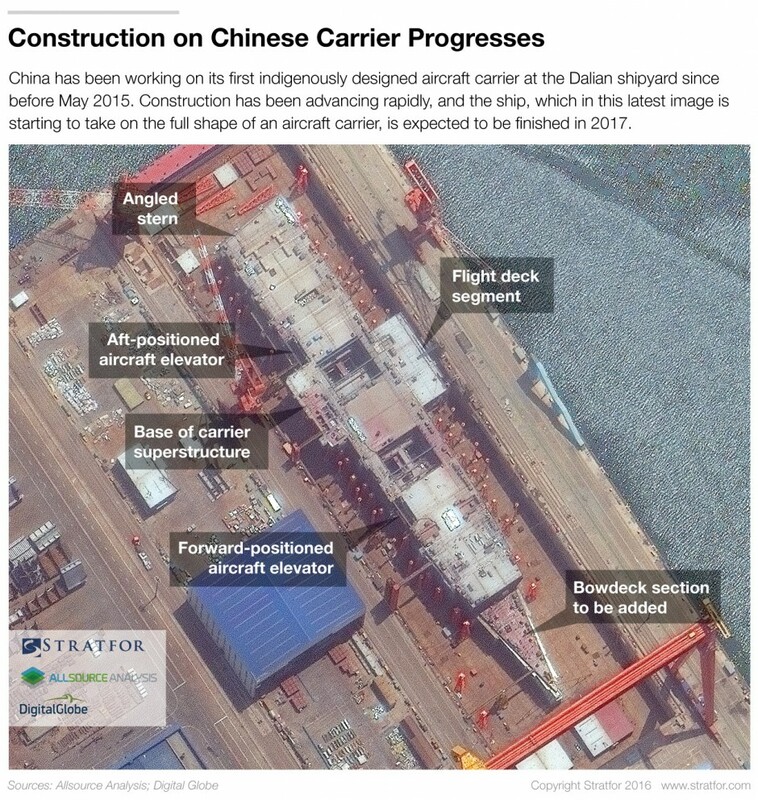 Since the beginning of the year, many modules have been assembled, including the below-deck hangar bay, openings for aircraft elevators, and in new photos, the ship’s ski jump soon to be welded to the carrier’s front. 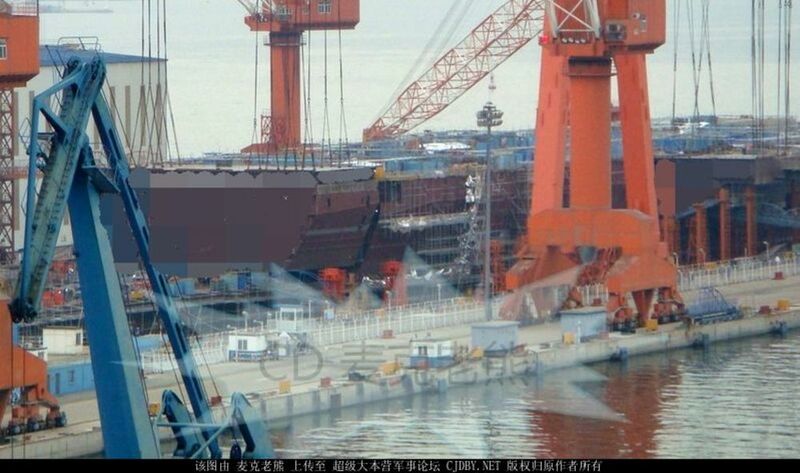 The Type 001A is still far from completion, and even when the hull itself is finished and launched, it will require years more of work to install electronics, crew amenities, and aircraft maintenance equipment. However, it should be able to run up to full capacity more rapid than its sister ship the Liaoning, since the PLAN will have nearly a decade of experience in operating carriers by this point. 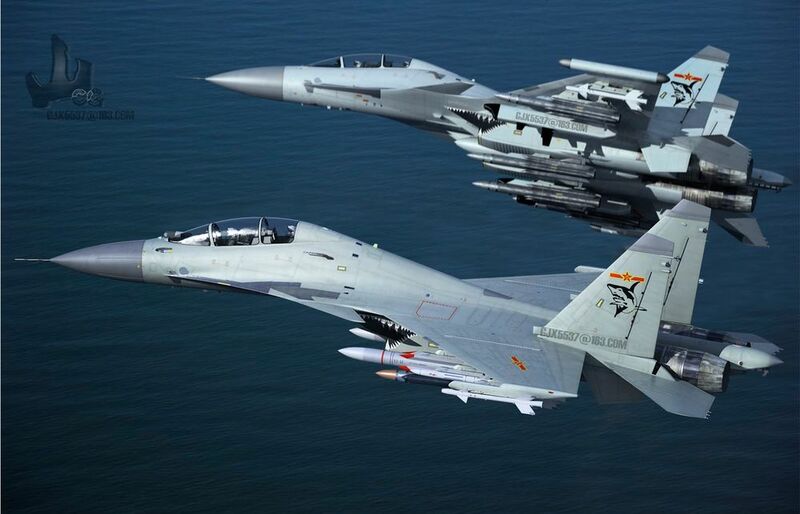 Like the Liaoning, it will play a critical role in building up China’s carrier pilot cadre, in addition to providing air defense and limited surface strike capabilities for Chinese surface warfare mission near and far aboard. China’s navy is getting ready to test aircraft carrier catapults. Satellite imagery dating to early 2016 shows the construction of two parallel catapult trenches at the test site; the wider trench is suspected to be equipped for a Electromagnetically Assisted Aircraft Launch System (EMALS) catapult. First used by the Ford class carrier, a EMALS catapult uses a linear motor drive, instead of steam pistons on older catapults, to accelerate the catapult shuttle holding the aircraft’s nosegear on the flight deck. Compared to steam catapautls, EMALS catapults are less maintenance intensive, mechanically simpler and have greater power and flexibility to launch aircraft of different sizes. If the Chinese EMALS catapult is selected and successful, the future Chinese aircraft carriers would be a truly formidable force. The second China-made aircraft carrier may adopt the Electromagnetically Assisted Aircraft Launch System (EMALS) catapult. Military expert Yin Zhuo said that was possible. If the EMALS is adopted, that means the aircraft carrier will use overall power system that features integrated electric propulsion, the application of electromagnetic gun and electromagnetic rail gun will just be a matter of time, and this technology may even be used to launch satellite. If breakthroughs can be made in those technologies, Yin continued, they will lead to broad prospects in the application of self-defense and high energy laser weapon on aircraft carrier.